The event information below is updated for 2019. Besides Valentine's Day, February also comes with a host of lesser known, but interesting nationally recognized days, that don't involve cupids. And, Shoreline plans on celebrating their uniqueness with visitors to this lovely spot. For every Ice Cream bought in the Bistro or retail shop before 12pm, you get 50% off a boat rental. Not so much feeding them as providing an educational station with some great info on ways for helping birds and other wildlife avoid getting into trash (and why it's so bad for them). Might as well be a national holiday... For Superbowl 53 (or LIII, for the roman numeral sticklers), drop by for some football-related treats, like football shaped sugar cookies. AKA National Fly a Kite Day. To celebrate both, every boy scout who comes by on that day, wearing their gear or presenting some other proof of membership, gets 50% off a kite in the retail shop. And, then, for flying purposes, the Park has a dedicated kite flying area. Be sure to avoid one by brushing teeth first, as Shoreline, in keeping with the Chocolate Amore theme, will have free chocolate for everyone who purchases any merchandise, rentals or food. Shoreline Lake staff are always willing to be helpful and engage with visitors, but on this day having a conversation with someone who works here also results in dipping into the Candy Bucket. As a way to extend the celebration, available from Feb 11th-19th, order a picnic basket for you and your loved one(s), and then get an hour of pedalboating for $10, or sailing for $35 (valid sailing certification required for sailboat rental). Or get a skipper to sail you around the lake, $35 for a 20-minute skippered ride for two, or $60 for a 40-minute skippered ride. Please reserve in advance for skippered rides, availability is limited. Shoreline Lake will host a community trash pick-up from 1-3pm. Participate and get 1 free boating pass for each family or group that helps make nature that much nicer. Buy two glasses of wine, get the third on the house. It'll be a surprise, as well as something special, and we're looking forward to what the Bistro's pastry chef will be baking up. Something so versatile deserves to be celebrated, so Nachos, Chips and Guacamole will be on the Bistro's menu that day. Welcome to Shoreline's Chocolate Amore Fest! With Valentine’s Day fast approaching, Shoreline’s put together a way for everyone to enjoy this yearly ode to romance, frilly card or no. Along with the usual, exquisite French and American pastries the Bistro offers, we’re making sure to entice our patrons with something new, by spotlighting the Italian origin of Valentine’s. 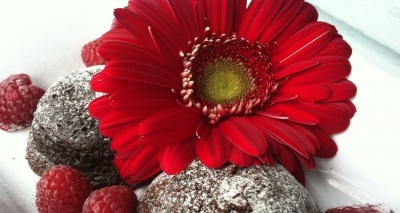 Expect to find a bit of a Romanesque twist with the chocolate and other goodies we’ll be serving. And, be on the lookout for other special treats that will only be available during this time. So, from February 8-14, come by for a chocolate laden extravaganza, where we have some fun with “LUV” in an outdoors and delicious ingredient kind of way. The Bistro is open weekdays (8:30-4) and Sat-Sun (8:30-5). If you would like to pre-order any items, please give the Bistro a call (650-965-1745). Chocolate Amore's timing also provides another way to impress your sweetie, along with your friends, co-workers, etc. Part of Shoreline's "From Grape Juice to Vintners Reserve" wine seminar series, the "Wine & Romance" wine tasting seminar can be specially booked (as well as customized) for groups on Thursday, February 14th. For more info check out the Wine Series page or contact the Events Team (at 650-965-3779 or via the Event Inquiry Form). *We can also add a bottle of wine or champagne to the basket for an additional charge. And, to make a package out of your day trip, for another $10, we’ll throw in an hour’s pedalboat rental. This Basket can also be ordered as part of another watercraft package, like the regular baskets. Here too, pricing is based on the type of watercraft – sailboat (with or without skipper), rowboat, canoe and kayak – and amount of time requested for the rental. To order this special Picnic Basket, just contact the Bistro at: 650-965-1745. And, as with the other baskets, we can adjust if there are more in your party. To order a watercraft package with your Basket, we’ve made it easy: Just contact the Boathouse (650-965-7474 or boathouse@shorelinelake.com), and they’ll take care of everything. If you would like to pre-order any items, please give the American Bistro a call (650-965-1745). These dense, incredibly rich and decadent chocolate flourless cakes are meant to be paired with a fruit sauce. In this case, raspberry only enhances the molten goodness and makes every bite of these individually sized delicacies a treat not soon forgotten. As popular in Italy as in France, mousses form the base for many a dessert, whether paired with pastry, or simply served on their own. This one is no exception: Layers of creamy, fluffy chocolate mousse are interspersed with raspberry mousse, topped with fresh raspberries and drizzled with a raspberry coulis. Even if you haven’t overdosed on chocolate yet, you’ll want to try this elegant, very tasty, classic dessert. Okay, so maybe a little more French than Italian, but who’s complaining. Wonderful on their own, regular madeleines are the absolute best afternoon tea bite…When paired up with raspberry, the flavor of these tiny, shell-shaped sponge cakes would make cupid come soaring into the room. Our take on hot chocolate and mochas: Add homemade raspberry marshmallows and presto… Shoreline’s divine chocolate beverages take on a whole new dimension, just bursting with lively flavor. Besides juxtaposing the richness of these house-made drinks, the fruit flavor shines on its own and makes for a truly unique taste experience that chases the nip out of the air. If you prefer celebrating St. Patrick's Day away from civilization and by taking in a great view, chances are the Bistro can help. As part of the regular weekend Brunch menu, from Saturday through Sunday (March 16-17), for anyone in need of a corned beef, mashed potato & cabbage fix, the Bistro will be serving this traditional favorite, as well as decadent chocolate-Guinness cupcakes with Irish buttercream frosting and Mint Chocolate Chip cookies, plus other seasonal items over the entire weekend. With the patio open, it's a great way to enjoy a Spring repast by the water. If getting even closer to the water is more your style, a picnic may just do the trick. And, Shoreline can help with that too. The Bistro has seven prepared picnic baskets from which to choose, including a vegetarian option. In addition, there's the popular pedalboat/picnic basket combo, as well as individualized watercraft packages, if you want to be on the water and not just next to it. For more info, or to have everything ready when you arrive, simply give the Bistro a call at 650-965-1745. Share an Adventure! 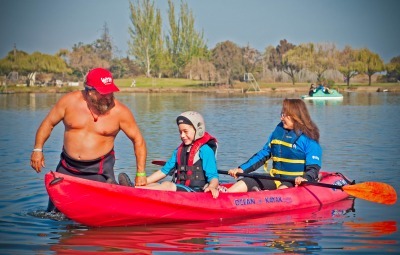 Shoreline is happy to help Paddle4Good spread the word about their four upcoming PaddleTogether events, which will be held at Shoreline Lake this year on May 25th, September 6th & 7th, and October 4th. Given the popularity of these events, registration for participants opens on April 13th (Since these events fill up in just a few days, Paddle4Good recommends registering your child soon.). With safety and inclusion as Paddle4Good’s primary goals, there is no restriction on special needs. And, participants have the opportunity to safely stand up paddle (SUP), kayak, peddle boat and more with a friendly band of community volunteers and skilled crew of paddlers. As spaces are limited, if you would like your special needs child (ages 4-24) to take part, please sign up via the Shoreline Event Notification List, so you can be notified when online registration is available. Regarding volunteers, it's not necessary to have experience volunteering or water skills to make a difference. Everyone is welcome, and you can choose to take part via three main groups (Buddies, Water Teams and the Support Team), where your skills and enthusiasm will be most appreciated. To be part of an event that helps connect different communities and makes a difference to kids who might typically not get to enjoy a day like this, please complete the online volunteer form, and Paddle4Good will contact you shortly. If you have questions or need more details, please contact Paddle4Good directly for additional assistance. Egg and Bunny time is here, and Shoreline will be holding its Fourth Annual Easter Bunny & Egg Extravaganza, on Saturday, April 20th! Cost to participate is $15 per child for the Easter Egg Hunt with all included activities if booked in advance (day-of tickets will be $20). Children up to a maximum of 12 years old may participate. Please bring your own basket for each participant to collect their eggs. To ensure everyone has a chance to participate, each child must be registered in advance. Register below via PayPal, or please contact the Events Team (at 650-965-3779 or events@shorelinelake.com) if you need additional details. Also, given the popularity of having Brunch at Shoreline on Easter weekend (both days), we also recommend that groups wanting to dine at the American Bistro make a reservation as well (650-965-1745 for the Bistro). Starting May 4th (National Candied Orange Peel Day), we're highlighting a florentine bar with toasted nuts, honey and candied fruits (including orange peel) atop pâte sucrée smothered in a layer of chocolate. And, if you do want to celebrate Cinco de Mayo, as well, away from civilization and by taking in a great view, chances are the American Bistro can help. May 4th-5th you can also expect to see some CdM offerings, such as: mole chicken enchiladas, chilaquiles, pozole, agua fresca, flan, Mexican bread, sake margaritas and a selection of Mexican beers, as well as other Mexican dishes joining the lineup. Shoreline is making sure visitors can take care of their favorite person the way she deserves. Give her a day to experience, in the way she wants..., relaxed and enjoying the people who love her most. Spending Mom's Day by the Lake tends to pretty popular, and we recommend making reservations, especially for larger parties. For more info, reservations, to order picnic baskets, etc., you can reach us via the Boathouse (650-965-7474), Bistro (650-965-1745) and Events (650-965-3779) lines. An Al Fresco Repast for Mom! ...and additions to the Brunch Menu: Croque Madame, Shrimp Caesar Salad, Salmon Tartine, Salmon plate with Lemon Caper Sauce, Baby Arugula Salad with Grilled Sirloin Steak, and specialty quiches (which include Spinach & Goat Cheese Quiche and Provençal Quiche). And, let's not forget adult beverages, including the ever popular Mimosa, Bloody Mary and Margarita, as well as Bellinis. With Kids’ menus available too, expect a great time. Check out the full menu for additional items, and for reservations, please give the Bistro a call (650-965-1745). For the Military, a little something: To ensure everyone gets a chance to try different ways to enjoy their free time, we’re offering current members of the military and their families a special rate (50% off through June 30th) towards watersports rentals and lessons. This offer might be something to consider if you and your family want to try a variety of watersports, or just want some time pedalboating. For more details about these activities, check out the Boathouse pages. Give us a call (650-965-7474) or drop on by, and we’ll be happy to answer any questions and get you started. Also, given the three-day weekend, Brunch is extended into Monday. FYI...Larger groups should plan on calling ahead to the American Bistro (650-965-1745) for reservations. Although the Park doesn’t allow for individual barbecues, on Sunday (June 17th), from 11am-3pm, Dad can have a barbecue picnic here, and everyone can enjoy being out on the patio taking in the waterfront view. And, to whet the appetite, another deal: For $15 per person (kids 2-4 years old free) get an all day access pass for kayak, canoe, pedalboat, and rowboat rentals. They’ll be available by the barbecue station. For more info on the access pass, just call at the Boathouse (650-965-7474). If Brunch is more your style, please contact the Bistro at 650-965-1745 to make reservations, particularly for large groups. In addition, Shoreline also offers pre-prepared picnic baskets as well. You can check out the Brunch Menu here, and the Picnic Basket page contains info on the Picnic Baskets (and on adding a watercraft package). Starting 10:00am, Saturday June 23rd, 2018, Silicon Valley's destination for lake sailing begins a weekend-long celebration of summer and sailing! 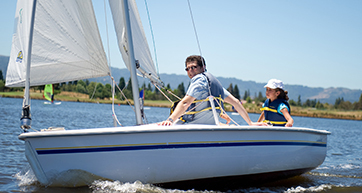 Besides free skippered sailboat rides for kids (ages 2-12), and free racing demos for Newbies/Non-Sailors, Shoreline Lake is also offering a free 30-minute intro lesson to sailing with the purchase of a Picnic Basket+Sailing package ($55, 2 people). The Sailboat rides and demos will take place starting from 10am through 6pm (both Saturday and Sunday). The Provence, The Bistro, The Farmers Market, and Just Like Home baskets will be available for this special package. 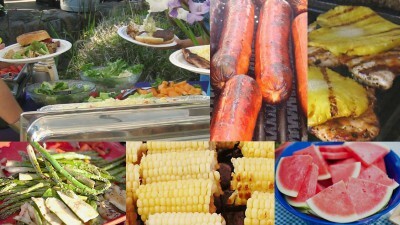 To see what is included in the baskets, check out the Picnic Basket page. For the picnic basket package, a free introductory sailing lesson will be included for up to two people. To add a third person (maximum of 3 people, minimum age of 5 years), please make sure to add another reserved spot to the basket package at purchase. •	$15 per person for 20 minute ride. Space is limited, and available on a first-come, first-served basis for the rides and demos, as this protected salt-water environment, set within the tranquil confines of a beautiful nature preserve, will also have its usual active sailing scene (Classes, Camps & Racing) going on at full blast. And, to make Brunch reservations (check out the Menu here), please contact the Bistro at 650-965-1745. See more about Summer Sailstice. 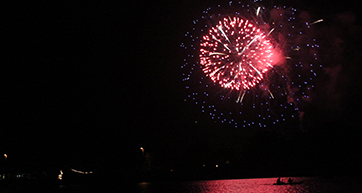 Enjoy the best view of the Fireworks Show, from the waters of Shoreline Lake! The Boathouse provides to Park visitors the most unique way in the Park (and the rest of Mountain View) to enjoy the fireworks – from a pedalboat, rowboat, canoe or single/double kayak in the middle of the Lake, with friends and family. Although watercraft are not allowed on the Lake after sunset, Shoreline makes an exception for Independence Day. The Boathouse is now taking reservations for watercraft rentals, so you can escape the crowds and watch the fireworks from the water. Online vessel reservations are available via Shoreline's booking system: Pedalboats $85, rowboats $85, canoes $85, double kayaks $60, and single kayaks $40. When reserving online you can also choose to add a wine and cheese platter for $40 (serves 2, choice of red, white or sparkling wine), or the Snack Pack option ($10/person – choice of hot cocoa, bottled water or soda; with an assortment of snacks). Please Note: Boat rentals for the Fireworks viewing are available by reservation only. Given last year's high demand, and to ensure that everyone can take part in this experience, the last rental time is specially extended, so you can reserve your preferred watercraft for the viewing. On July Fourth, regular rentals must be returned by 8:30 pm, to ensure patrons with reserved vessels can board first – starting at 9:00 pm. This makes sure you can get out on the water before the show begins and can enjoy the entire show from your vessel. Also, after the show, watercraft will need to be returned by 10:15 pm. By the Boathouse. While the Park doesn't allow for individual barbecues, on the 4th, from 11:30am-6pm, we're making it easy for everyone to have a barbecue picnic here, and enjoy being out on the patio taking in the waterfront view. 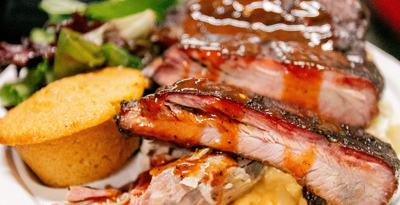 Expect a good plateful and variety: For $13, $15, or $17, you'll get a choice of 1, 2, or 3 types of meat (burgers, chicken, hot dogs, sausages, and veggie burgers on the grill), as well as a choice of 2 different sides (green salad, potato salad, coleslaw or baked beans), to make sure everyone gets what they want. Bistro hours will be extended to 10pm for the occasion. We’re also making it easy to whet the appetite with another deal: For $15 per person (kids 2-4 years old free) get an all day access pass for kayak, canoe, pedalboat, and rowboat rentals. They’ll be available by the barbecue station. 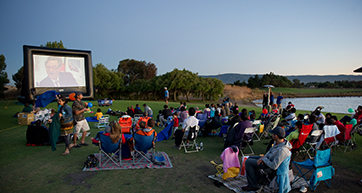 For more info on the access pass, just give us a call at the Boathouse: (650) 965-7474. This Basket can also be ordered as part of a watercraft package, like the regular baskets. Here too, pricing is based on the type of watercraft – sailboat (with or without skipper), rowboat, canoe and kayak – and amount of time requested for the rental. To order this special Picnic Basket, just contact the Bistro at: (650) 965-1745. And, as with the other baskets, we can adjust if there are more in your party. Need another excuse to drop by in July? Starting Saturday, July 14th (through Sunday the 15th), Shoreline Lake will be helping Francophiles commemorate the French National Day. 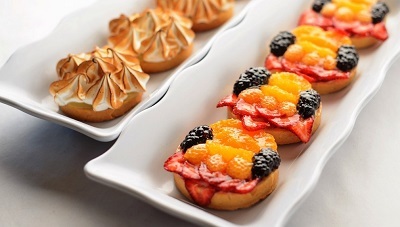 The American Bistro will be featuring new additions to the "usual" lineup of house-made, real French pastries, confections and savory treats: Look for additional sweets such as éclairs, cream puffs, and an assortment of French macarons, as well as savories like croque-monsieur, Classic French onion soup, and a tartine sandwich. With boats on the water, a view of nature, a glass of wine with friends and family on the Bistro patio (or getting a group together for a private French Wine Seminar), this laid back fete is a tranquil way to mark the middle of summer. 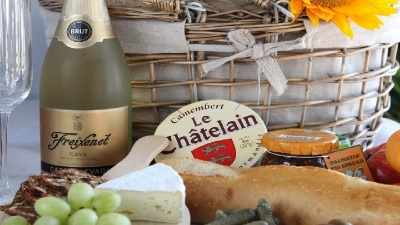 And, to celebrate picnic-style, besides the "Provence" and "C'est La Vie" baskets, Shoreline also offers a customizable "A Picnic Unmatched" pre-prepared picnic basket that includes wine, choice of sandwiches, salads, and, of course, French pastries – all of which can be part of the pedalboat package if desired. 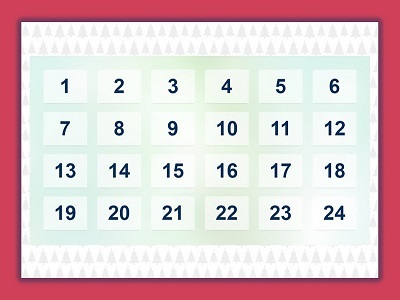 No laborious Labor Day in sight. Relax and enjoy a waterfront respite, where everyone can take advantage of the American Bistro patio's lovely view, and where weekend brunch is extended into Labor Day itself. 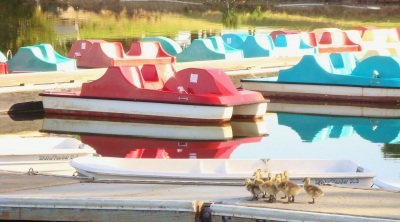 In addition to Shoreline's popular pedalboat/picnic basket option, for visitors wanting more activity with their repast, the Boathouse can put together customized picnic basket/watercraft combinations, based on the seven options available for prepared picnic baskets, type of watercraft – sailboat (with or without skipper), rowboat and canoe -- and amount of time requested for the rental. The desired watercraft, as well as picnic basket, can be reserved via the Boathouse (650-965-7474 or boathouse@shorelinelake.com). Even with these offerings, you can still opt for the regular Bistro menu, and the prepared picnic baskets will also be available separately, in addition to real French pastries, a whole host of other watersports and land-based activities, plus much more... All by the water's edge. How did the Great Pumpkin fix the hole in his pants? With a pumpkin patch. HALLOWEEN IS UPON US, so come join our Pumpkin Splash, including the Shoreline Lake pumpkin patch! Dates for this year will be October 13 - 31, 11am-5pm (weekends) & 10am-5pm (weekdays). This pumpkin extravaganza has something for everyone, big or little, to enjoy. Enjoy the pumpkin patch surrounded by hay bales on a beautiful lake setting. And, visitors who come dressed up also have a chance to win a raffle ticket for an all-day boating pass. Along with locally grown pumpkins, there will be craft activities for children, a bounce house, boating passes, pumpkin painting & pumpkin carving, cookie decorating, an old-fashioned bake sale and many photo opportunities (carving/decorating activities and bounce house not available weekdays). 1 person all day access boating pass to pedalboats, canoes, kayaks and rowboats, stand up paddleboards along with 1 pumpkin and time in the patch. Additional passes for boating only available at $15 per person. To reserve passes for larger groups (as a team building exercise, perhaps), please give our Events Team a call at 650-965-3779. And, if you prefer a more serene orange gourd experience, the patch and seasonal treats (real French and classic American pastries, as well as other gourmet treats crafted on-site) will also be available during the week. 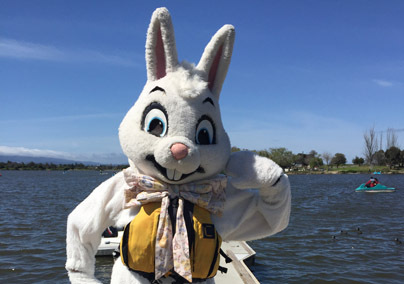 Remember to come dressed up in order to get a raffle ticket to win an all-day boating pass here at beautiful Shoreline Lake. The American Bistro will be showcasing, for a limited time, the first harvest of some unique organic fruit: Since the Boathouse & Bistro owner advocates using locally grown, seasonal products, she and her family are making available – exclusively to Shoreline Lake – this quality fruit, grown at their ranch in Pescadero. 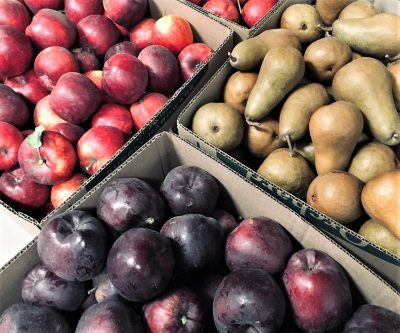 If in the mood for fruit of premium flavor and sweetness, visitors can purchase freshly picked, pesticide-free, sweet and juicy Gala and rich ruby red Scarlet Spur apples ($3/bag, $20/case), as well as enjoy the tree-ripened Bosc pears in the Savory Pear & Persimmon Salad that will be part of the special Autumn Spice Week menu below. As the first harvest from a private, non-commercial ranch, only fruit from a select few trees will be harvested this year (hand-picked over the next two to three weeks, likely into early December, to ensure peak ripeness). And, in keeping with Shoreline's emphasis on seasonality, when this quality fruit runs out, that's it until next Fall. Autumn Spice Week & Beaujolais Nouveau Celebration! Get your tastebuds prepped. Shoreline is shooing away the grey weather with the 8th Annual Autumn Spice Week. Come by the American Bistro, Monday (Nov. 19th) through Sunday (Nov. 25th), and enjoy a change of pace from the Thanksgiving/Black Friday rush. Besides highlighting seasonal, spice-laden treats, and the release of this year's Beaujolais Nouveau, we’re making sure visitors can partake in a civilized respite from Turkey Day preparations and Black Friday craziness. 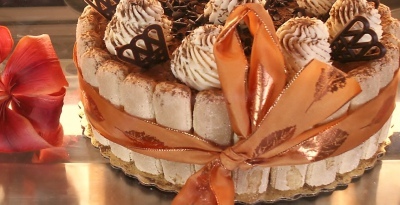 Along with the usual, exquisite French and American pastries the Bistro offers, holiday pies and traditional “Fall-centric” items will be on hand, in addition to goodies with a more exotic take, as well as some new items that will be rolled out during the week. And, "le Beaujolai Nouveau est arrivé!” at Shoreline on the official release date (Thursday, Nov 15th). The "BN" will be, along with a Salmon Tartine and French Onion Soup, a celebratory addition to that day's menu. Given its fresh, fruity (and food-friendly) qualities, this versatile, light wine – served chilled – is perfect for lunch and an early afternoon repast... and we scored some of the Domaine Dupeuble (distributed by Kermit Lynch). The facilities at Shoreline will be open early on Thanksgiving Day (to give everyone the chance to enjoy some outdoor fun, relax, pick up dessert for the big feast, etc. ): Bistro hours will be 8:30am-3pm, and for the Boathouse, 10am-3pm. For the rest of the week, you can expect the regular Fall/Winter hours). Cinnamon, cloves, nutmeg…spices that should always go into a pumpkin pie, and you can certainly find them in this one. In conjunction with the aromatic nature of the pumpkin, they provide a fullness of flavor that makes the silky smoothness of a properly-prepared filling shine. Offset by a perfectly baked crust, this combination explains why it remains a tradition. Here's to giving a classic the amazing award. Also call Derby Pie, the addition of dark chocolate and bourbon gives "regular" pecan pie flavors additional and deeper nuance. Not a bad way to make this pie even more interesting, while keeping the sweetness and texture of all the components balanced. Although a generic term for tea in many parts of the world, in the US, we primarily associate Chai with the Indian masala spiced tea beverage. This hot, sweetened, spiced milk tea uses a variety of different spices (generally cardamom, cinnamon, ginger, cloves, and pepper) to produce a warming, soothing effect that’s tough to resist on a cold day. As a base for a variety of different seasonings, pumpkin can’t be beat. This version of pumpkin soup takes advantage of this versatility. Redolent with sage and the richness of roasted pumpkin, this warming, hearty soup keeps the chill away. For a little lighter fare, that's still in keeping with the week's theme, this mixed green salad topped with sweet, seasonal pears and Fuyu persimmons makes for a satisfying lunch, that still allows one to have room for dessert. The savory dressing and Mayfield baguette make a great complement, giving the sweetness a little edge, and playing off the fruits' inherent spicing. Imagine the headiness of tasting sweet butternut squash laced with the flavor of nutmeg. 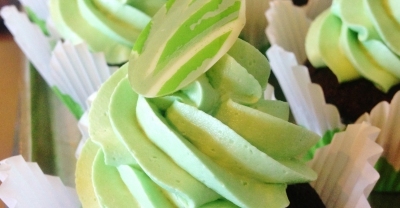 But rather than just sweetness, you’ll also take a savory turn. Shoreline’s not only done that with this soup (by drizzling the top with truffle oil), but, by garnishing with toasted pumpkin seeds, you’ll also experience a lovely juxtaposition of textures and tastes in every spoonful. It’s the Bay Area. Traditional can mean a lot of things. With such a heavy Mexican influence here, no way can we leave out this spice-oriented cuisine. While moles (pronounced MOH lehs) run the gamut from very hot to mild, ours has the right amount of heat to perk up the tortillas in this dish and what’s normally a mild flavored filling, as well as cut through the richness of the cheese topping. Layers of laminated brioche with crystallized ginger, candied lemon and orange – a perfect morning bun with a cup of Shoreline's artisan coffee. Every bite brings with it a kaleidoscope of flavors. Spicy, buttery, citrusy, etc., we can't think of a better way to start the morning off, or to give yourself a well-deserved break. Forget just adding a bit of extra spicing to a “regular” muffin. 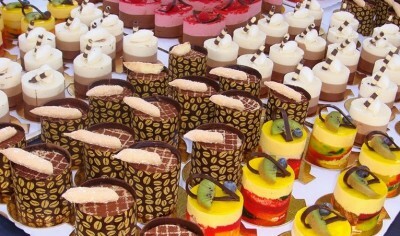 We wanted to create something a little different that really brings out the delicate flavor of these teeny cakes. So, rather than top it off with a sugary, one-note icing, we decided to use a multi-colored array of raisins and walnuts. The variety of flavors from combining the fruits and nuts complements the pumpkin and spice in the sponge itself and ensures every bite is crunchy and sweet, as well as moist and flavorful. Autumn perfection. Old-fashioned, yet timeless. Soft, chewy and decadent, the molasses creates a beautiful balance and flavor explosion with the candied ginger. Be forewarned. One will not be enough. 'Nuff said. Every day from December 1-24 a new "door" opens, and each is a chance at winning four different prizes – a $50 gift certificate (towards Weekend Brunch for 4) at the American Bistro, a Camp Shoreline Scholarship, a Pedalboat + Picnic Basket Combo for the week of Valentine's, and a Spring Windsurfing Seasonal Membership (for yourself, or as a gift)*. All you have to do is submit an entry. And, if you see something you would like the Bistro to prepare, please let us know at 650-965-1745 (Don't worry, any opened door in the calendar will stay open during the entire 24 days.). Enjoy! *Please be aware: The Windsurfing Seasonal Membership prize is restricted by ability level. Details can be found on Shoreline's Registration page. Welcome to Shoreline's eighth annual Winter Chestnut Fest! 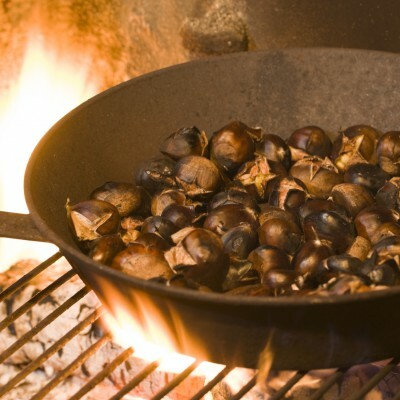 If you’ve never tried chestnuts roasted al fresco over an open fire, now’s your chance. It’s the perfect opportunity to take part in a beloved winter tradition not often seen in this part of the world. Starting December 8th, through the 16th, besides highlighting other Holiday goodies, gift certificates, etc., we’re making sure visitors can watch our skilled roasters turn these tasty imported Italian nuts into a winter delicacy. And, as the SJ Merc (and a few others) can attest, they're also great for warming up cold hands. So along with the usual, exquisite French and American pastries the Bistro offers, make sure to pick up your own paper cone of chestnuts, and be on the lookout for other special Holiday treats that will only be available during this time. Other than closing December 24-25, the Bistro will be open Mon- Fri (8:30-4) and Sat-Sun (8:30-5). Individual paper cones will be $5 each. Larger batches will also be available, priced at $9. This schedule makes it easy to bring some home, back to the office, etc., but if you would like to have us roast a batch outside of these times, please let us know. A flavor combination that can’t be beat... Pairing up chestnuts with the earthiness of celery root makes for a rich and silky comfort food that’s perfect for the Holidays. The sweet, herbal and nutty flavor of this lovely vegetable soup will certainly drive away winter’s chill. Another classic pairing. In this case, sweet-tart apples give celery root a different kind of boost: One that's a bit more herbaceous, but just as rich, and just as much a Holiday tradition. A Bit of Red Anyone? A little raspberry jam filling between almond cut-out cookies...doesn't begin to describe just how pretty and tasty these Holiday tarts can be. As a perfect accompaniment to a piping hot cup of coffee or cocoa, these melt in your mouth treats are the perfect way to say Merry Christmas! Pairing the tartness of cranberries with the lively citrus flavor of freshly squeezed lemon juice gives these beautiful little loaves their wonderful flavor and festive spots of garnet red color. And they're good for ya'...lots of Vitamin C.
Straight out of the 60's, these earthy whole-grain muffins bring together a blast of flavor, texture and moistness thanks to the addition of carrots, nuts, dried fruits, a variety of spices and more. Just sweet enough, these little cakes makes for a great breakfast and/or snack. ...Or Buche de Noel for the technical. Shoreline has two varieties of this log-shaped, rolled sponge cake this year: Vanilla with Lemon Curd Filling & Chocolate with Coffee Filling. Dusted with powdered sugar and decorated to resemble their forest brethren, these treats taste as lovely as they look. For a little mint jolt along with that of your caffeine, try a classic mocha laced with peppermint. As a dessert or a nice break away from shopping, the office, etc., it's hard to go wrong with this seasonal treat. For the little ones, or if you'd rather just skip the caffeine, we've got you covered there too. Shoreline's minty hot chocolate will do the trick. An infusion of cardamom, clove, allspice, black peppercorns, and orange falls way short of describing the richness of flavor in Shoreline’s take on this traditional Holiday beverage. Common during the winter in countries with colder weather, this satisfying and relaxing beverage has a way of making this time of year a little more pleasurable. The non-alcoholic, but just as tasty, version that uses sweet-tart apple cider as its base. Warm yourself and the kiddos with this comforting, spicy concoction that chases the chill away. For a little breather from all the Holiday baking and running around, we can help. Besides crafting Shoreline's special Christmas Cookie Packages – which include Russian Tea Cakes (aka Mexican Wedding Cakes), Cranberry Thumbprints, Ginger Molasses Cookies, Florentine Bars & Palmiers – our in-house pastry fairies can whip up exactly what you need to make a perfect food gift, for parties or just to snack on during the day. 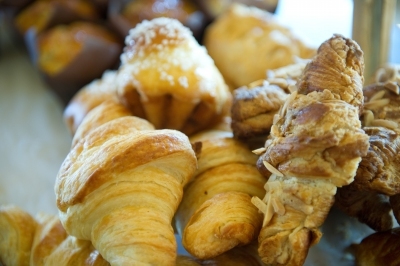 Although we do keep a good variety of treats on hand at the Bistro, given how fast our cookies, desserts and other pastries tend to fly out the door, it probably makes sense to pre-order yours. Just give the Bistro a call at 650-965-1745. And, if you need something special for an office party, meetings, end-of-year teambuilding and other events, please contact Johanna Trevino, Shoreline's Events Manager (at events@shorelinelake.com and 650-965-3779) for customized orders, onsite catering, and any help getting the stars aligned for a successful Holiday get-together.